Outlook.com (formerly known as Windows Live Hotmail) is a new and exciting mail service that is made directly from the minds of developers at Microsoft, creators of the world best known operating systems Windows XP, Windows 7 and Windows 8. With years of experience in online ecosystem, and millions of users of their award winning cloud storage service SkyDrive, Outlook.com offers to everyone the best possible mail experience that can be found on the web. Everything you need can be found in its web-based interface – powerful tools, integration with SkyDrive, folder support, instant chat connection with MSN and Facebook users, and absolutely no space limitations. Outlook.com is a perfect mail client for everyone, no matter if they are novice or professional. Try it out now! Free and official email service of the software giant Microsoft. More than 15 years ago, when internet as we know it today was in its infancy, Microsoft managed to popularize one of its most successful apps of all time - Outlook email manager. Features that were inserted into that program managed to define how we interacted with the world using emails and as the time went by, webmail services that started appearing all around the internet strived to emulate what Outlook as much as possible. Sadly, while AOL, Yahoo! and Google managed to elevate their service into state that internet public easily embraced, Microsoft’s own Hotmail remain static, with features, UI and tools that were hard to use and light years behind Gmail. However in the summer of 2013MS decided to change all this with the introduction of completely revamped webmail service for Outlook.com, offering every Hotmail users the way to convert their email to new online provider and to take all the advantages from this beautiful, powerful and intuitive service. With Outlook.com Microsoft has finally managed to produce webmail experience that is worthy of this popular company, with features and design that will enable you to fully control your email inbox. 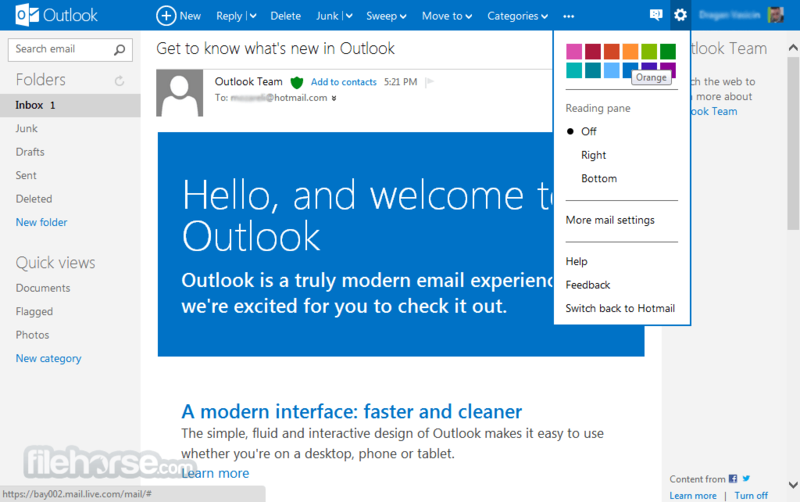 From the moment you arrive on Outlook.com you will see that this service has been fully integrated into visual style of modern Microsoft and Metro UI. Very pleasing visual style enables you to effortlessly start using basic functions that every email client needs to have (basic folders, search, create new email, reply, forward, basic email management). However, if you dig just a little big under the surface you will find a wealth of advanced tools that enable you to take complete control over your email experience. For example, you can create new folders that are populated with emails from particular sender or with particular title line, you can easily move/delete/schedule cleanup of all emails from particular sender, enabling you to clear your main inbox from clutter. 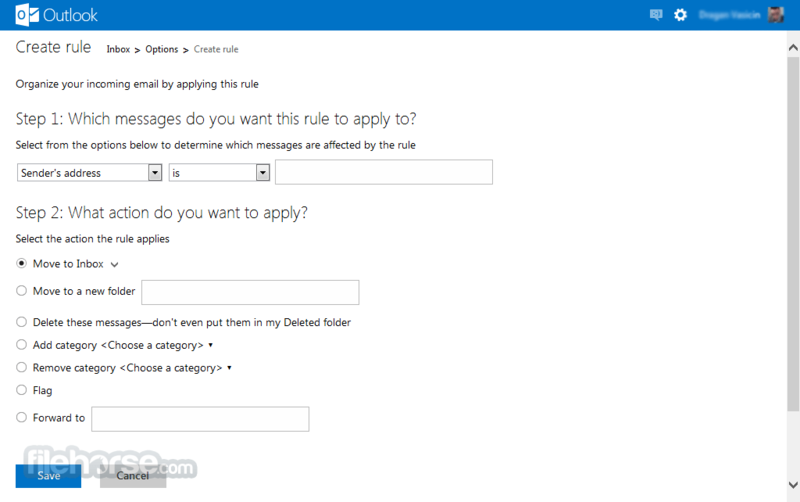 Very powerful “Create Rule” tool will enable you to choose a type of message (via its subject name, sender’s email, subject, attachment), and automatically preform a action to that message (move to folder, delete, add category, flag, forward). Search function is very powerful, especially if you take advantage from “Quick View” tool that enables you to filter out all your images in your email account, attachments, flagged messages, shipping updates and more. All in all, new Outlook.com webmail service is modern, functional and very easy to use, managing to easily rival Gmail in terms of its functionality and style. 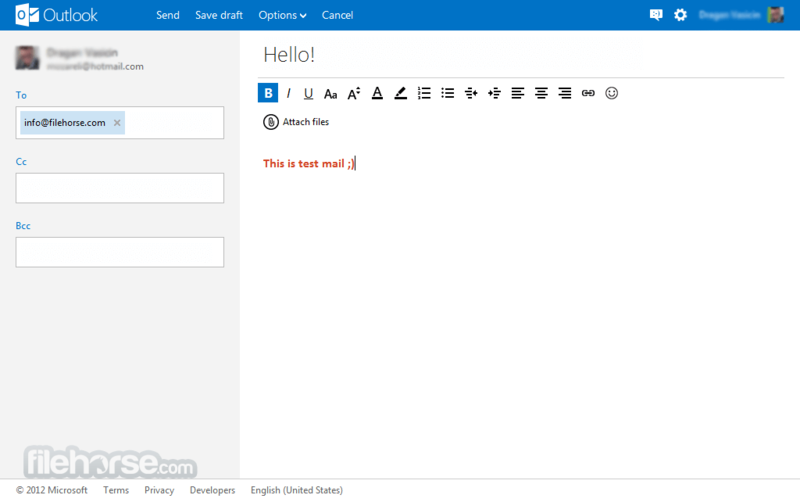 You can say goodbye to the old and barely functional interface of Hotmail, because Outlook.com finally brings aninnovation and style to the Microsoft’swebmail offering. Default blue theme of Outlook has managed to perfectly showcase the Modern UI that Microsoft has adopted in their entire modern product line, enabling everyone to easily adapt to it. All features and navigational tools of this webapp are nicely placed across the webpage, there is no clutter and all the new tools have easy-to-learn functions that you will instantly wish they are available on other webmail services. 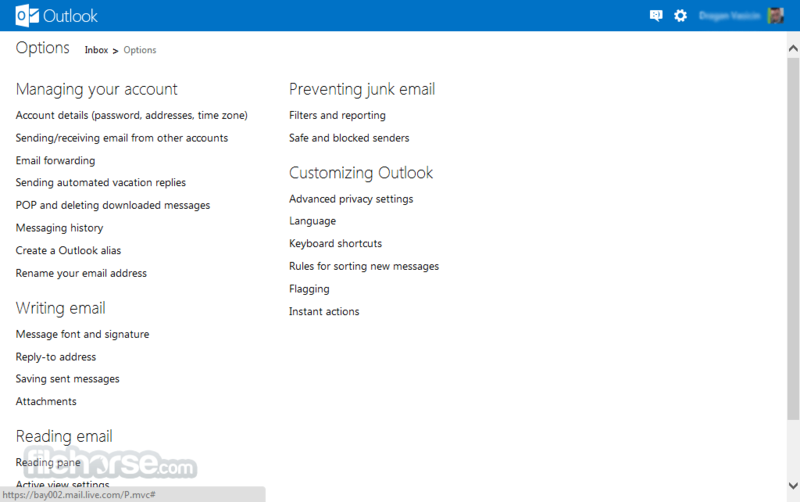 Creating a new account on Outlook.com is free, and it will take only few moments of your time. There are no subscription costs or paid locked features. Everyone gets the same access to everything that Outlook.com offers. The only thing that can be upgraded is off course SkyDrive storage space, with you having access to only 7 GB for free. Outlook.com has managed to reinvent itself in dramatic way, offering everyone one of the best email services that can be found today on the internet. It’sbeautiful, functional, fast, intuitive and enables all Hotmail users to switch to it in just few clicks. Amazing New e-mail service from Microsoft!